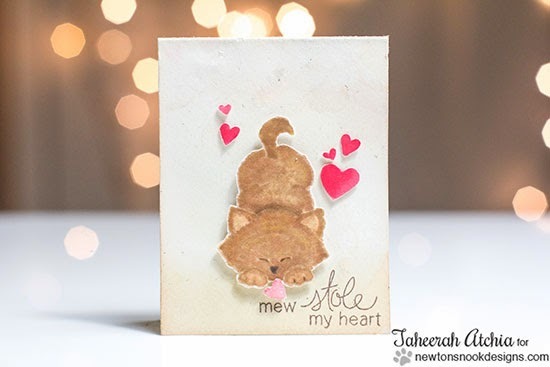 Newton's Nook Designs: "Mew Stole my heart" Card by Taheerah! This little kitty will steal your heart! 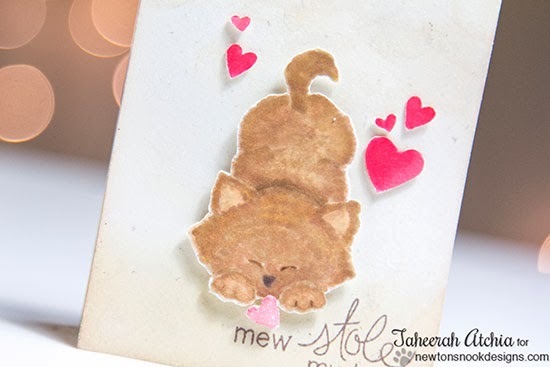 Don't you just love this adorable kitty card by Taheerah Atchia? She took the kitty from the Newton's Antics stamp set and colored it with the "no line" coloring technique! I love how he looks soft and fuzzy! Plus, what a cute little mini card size! How fun is that? She also used the "stole my heart" sentiment from our Sweetheart Tails set and replaced the "you" with a "mew"! So cute! Thanks, Taheerah, for the fun inspiration today! Want to learn more about this card? Head over to Taheerah's Blog, Fill Your Paper with the Breathings of Your Heart today to read more. Make sure to say hello and check out more of her amazing work! I just love this card. Your coloring is fantastic. I also like how you combined sentiments. What a fluffy, furry feline! Her work is so amazing! incredible!!! that no line coloring is just stunning!! and that little kitten looks so fluffy!!! this is so adorable!! What a splendid showcase of no-line colouring; the little kitten look so cuddly in his furry coat! Awesome job, Taheerah! !